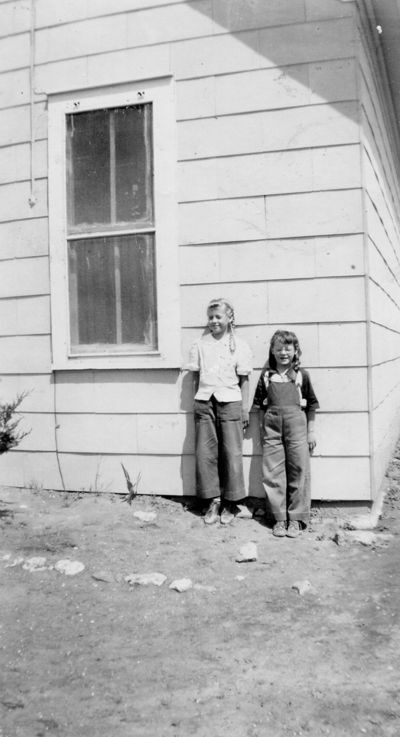 The first school in District #26, was the Two-Mile School commonly known as the "Little Red Schoolhouse." It was located, on the section line between the homesteads of Thomas J. McKinney (section 35) and H.L. Woodruff (section 34) T34-R26. a note from Gloria McKinney who shared this photo with us. 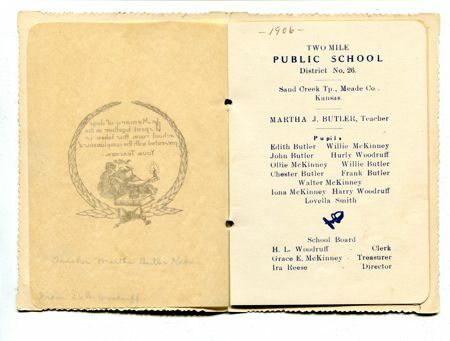 Surnames of students attending Two Mile were: Butler, Curtis, McKinney, Smith, and Woodruff. 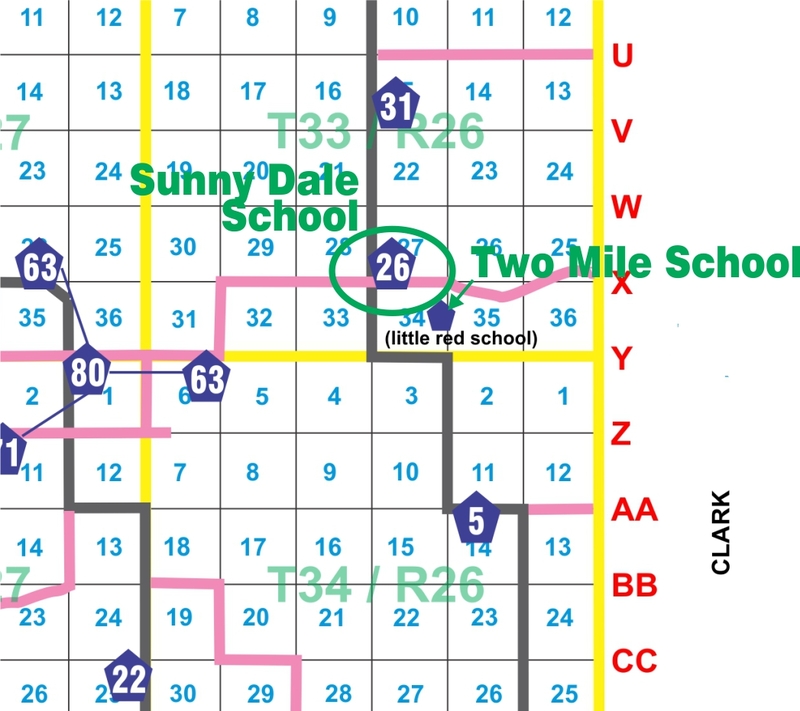 This modern-day map shows where the schools were in relation to roads and where other schools were located. As you can see these schools were pretty close to the Clark County line in the southeast corner of Meade County. 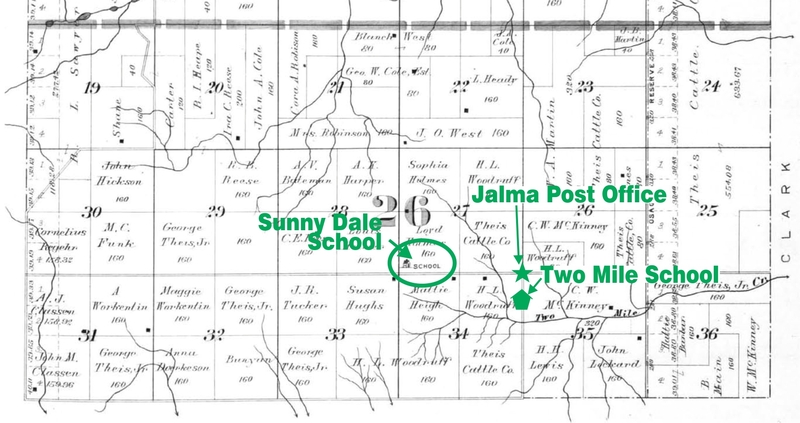 Our best guess is that the Sunny Dale school was built around 1906, on the SW/4 of the SW/4 of Section 27-T34-R26. 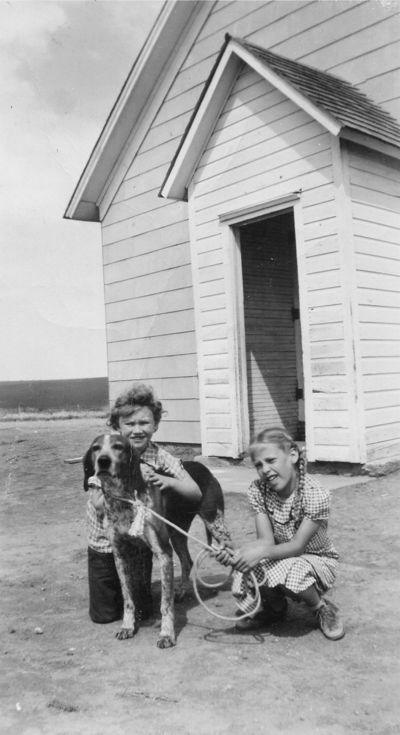 The district unified in1965, but the last teacher listed in Sunny Dale was the term that ended the spring of 1958. For over 50 years this building not only served the school district, but was the hub of community activities in the southeast corner of Meade County. 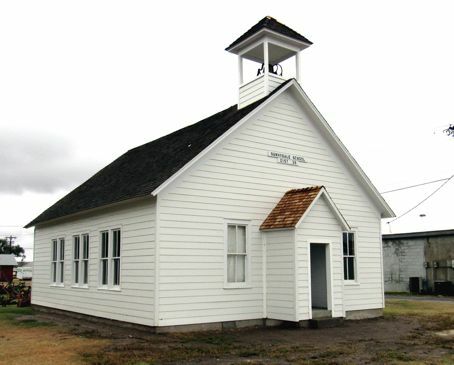 Sunny Dale schoolhouse was used as a community building for ice cream suppers, oyster suppers, Thanksgiving dinners, Christmas programs, and the Literary Society. 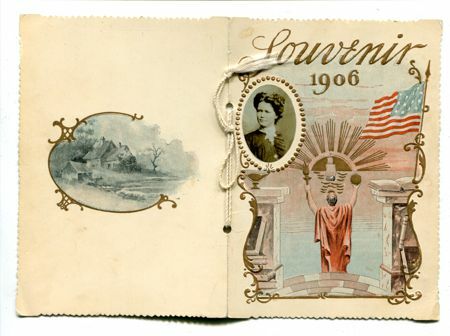 It was also on the Methodist church circuit for several years in the early 1900's. It was used for church and Sunday School in the early 1920's. 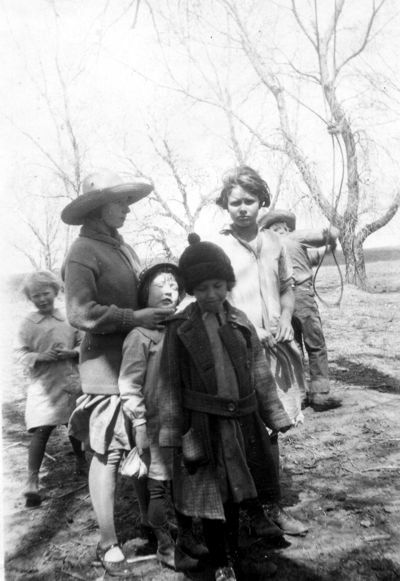 Sunday School at this time was started by Mrs. Charles McKinney from Englewood and it continued there until the school closed. 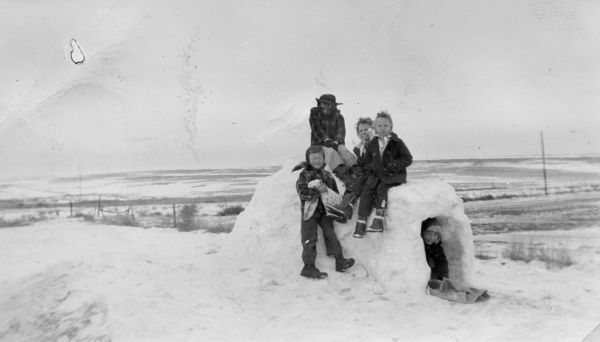 Even after the school closed, the building was still used for several years as a community center for Thanksgiving dinners, Christmas programs and elections. The Meade County Historical Society acquired the school in 1977, and it was moved to their "farm lot" a half block south of Hwy 54 on Pearlette St., then in 2016, it was again moved to the lot just north of the Museum on North Meade Center. 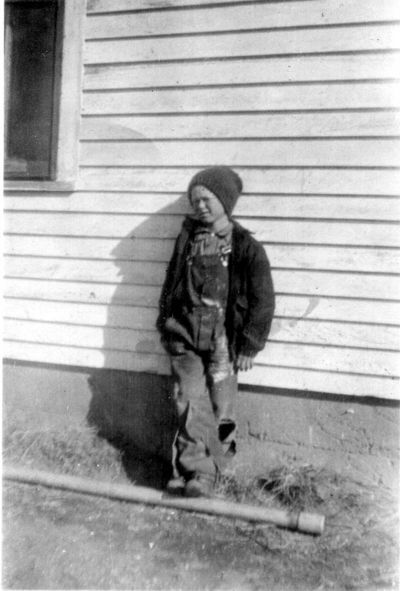 The building is now a museum exhibit to be enjoyed as a tribute to all the rural schools that dotted Meade County from the 1880's to the 1940's and beyond. Alexander, Austin, Brown, Butler, Cagle ,Carlson, Chandler, Cook, Covalt, Craig, DeVore, Ediger, Edwards, Embrey, Epp, Fuhrman, Greenstreet, Haepe, Haney, Horner, Hughes, Kelley, Kimes, King, Little, Mayberry, McKinney, Moore, Murphy, Painter, Powell, Reinert, Rogers, Shepherd, Smiley, Stacy, Stalder, Stith, Thiessen, Ware, West, Whetstone, , iens, Woodruff, and Woods. Cornelsen, Bailey, Dunn, Ediger, Finlay, Fuhrman, Gowens, Greenstreet, Gumpenberger, Johnson, McKinney, Painter, Reinert, Rogers, Specht, Whetstone, and Woodruff. 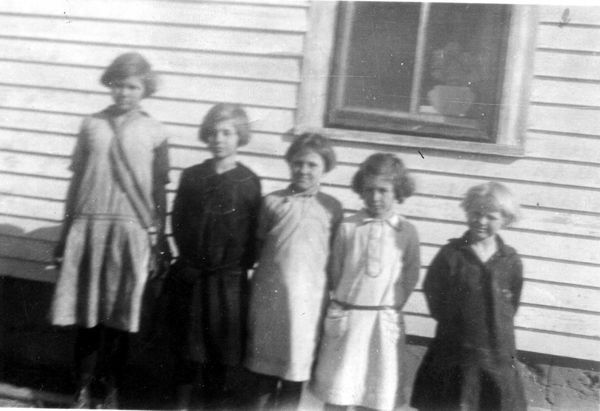 Irene Greenstreet, Daisy Haney, Gladys King, Alma Haney, and Mary Greensteet. 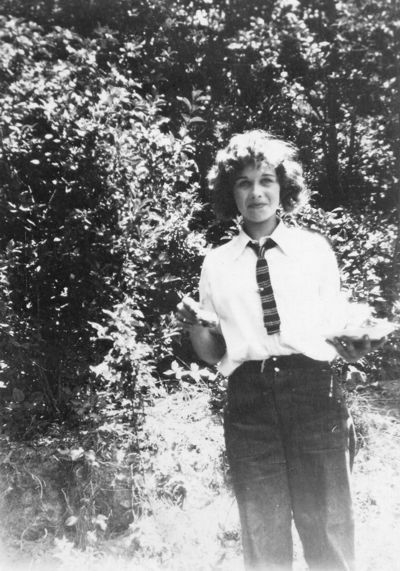 Daisy Haney at a Sunday School picnic. 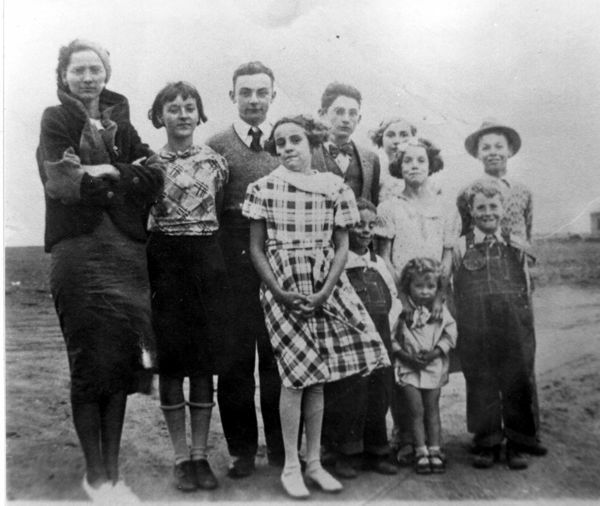 back row: Norma Harper Feldman (teacher), Bernice Woodruff, Joe Woodruff, James Powell, Esther Powell. 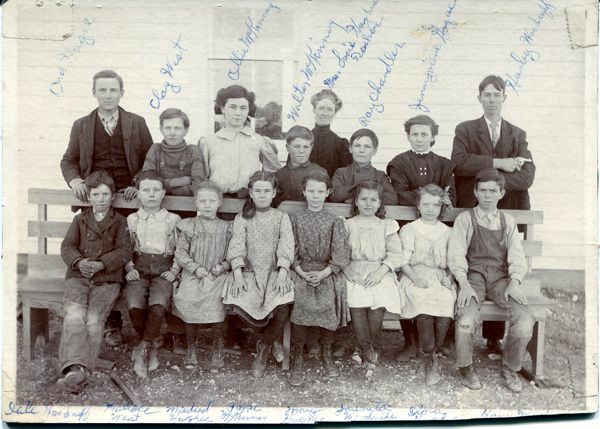 middle row: Betty Horner, Kenneth Woodruff, Margaret Woodruff, Bernard Woodruff. front row: Phyllis Woodruff (a visitor), Dale Lewis Woodruff. 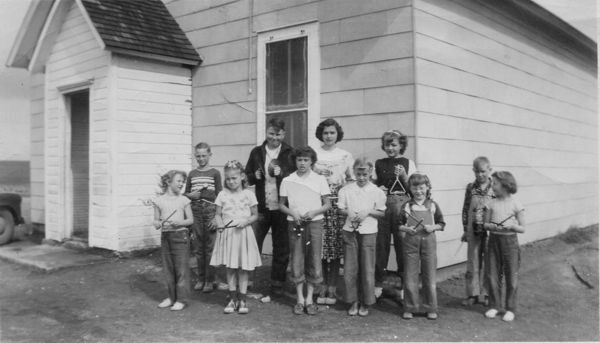 l to r: Diane Ediger, Marvin Cornelson, Patty Furman, Jack Painter, Jean Painter, Fern Furhman, Dorothy Specht Carol Furhman, Laura Belle Specht, Donald Ediger, Joetta Ediger. Back row: Osa Hughes, Clay west, Ollie McKinney, Walter McKenny, Mrs. Susie Hughs Docker, Roy Chandler, Genevieve Hughes, Hurley Woodruff. front row: H. Dale Woodruff, Wallace West, Mildred Hughes, Iona McKinney, Mary Hughes, Juanita Woodruff, Dora Hughes and Harvey Woodruff. 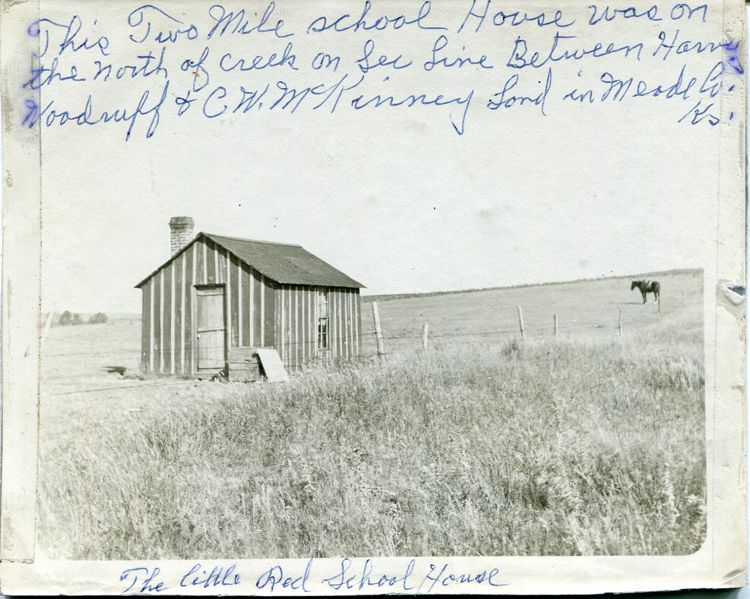 Sunny Dale School as it stands today on the lot north of the Meade County Historical Museum, Meade, KS.